Shawarma (or shwarma as I prefer to spell it) is an Arab food that came to Israel via our large immigrant population from the Arab world. Many of our best local foods come from this population. Foods such as falafel, chummus, sabich and shakshuka (all of which might warrant a post of their own) come from Israel’s Sephardic Jewish community. Shawarma consists of pieces of spiced meat, piled on a vertical spit in an inverse cone shape, slow roasting as it rotates for hours on end. And that rotating vertical spit is truly the key. The word “shawarma” itself derives from a Turkish word that means “turning,” and the vertical positioning allows the flavors to drip from top to bottom, thus keeping the meat moist and tasty. That meat is then shaved or cut off in small pieces and typically served inside of a pita or a laffa (a thick, flat bread wrap that is larger than a regular pita) along with various spreads, sauces and vegetables. Now before I go any further, I must point out that while many cultures have a dish that seems very similar to shawarma, they are far from identical. For example, many of you who are unfamiliar with shawarma may be saying right now, “Hey, isn’t that just a gyro?” In truth, the dishes share common ancestors, but they are quite different from each other. For starters, traditional gyros are made using pork, a no-no both for Jews and for Muslims. Shawarma, on the other hand, is traditionally made out of lamb, though lamb shawarma has grown increasingly hard to find. More commonly these days you will find it made from turkey or baby beef (which they call veal, but which isn’t real veal). Often you will see a tomato and/or an onion on the top of the spit, supposedly adding flavor to the meat. But in all honesty, I can’t imagine one of each of those on top adding much flavor to such a large cone of meat! I think they are just there as a gimmick, and challenge anyone to identify the difference in a taste test. More often then not, however, a large hunk of fat sits on top, slowly melting and dripping down onto the meat, keeping it moist all day. (Hey, no one ever said good street food is actually healthy food!) If you look at that first picture in this post, you can clearly make out the layer of fat sitting on top of the turkey that is roasting there. Interestingly, the fat is usually lamb fat, so that even turkey shawarma gets a bit of the traditional flavor. Me eating a delicious shawarma in a pita. In contrast, shawarma has a combination of traditional Middle Eastern spices on the meat and the sandwich will usually include chummus or techina. For those who prefer their food with a spicy, flavorful heat, schug is another traditional spread for your shawarma (I enjoy the flavor/heat combo of green schug the best). But if you want to really look like a local, add some amba sauce to your shawarma. Amba is a curried mango chutney that has a bit of heat of its own, and was brought to Israel by Iraqi Jews. One of the fun things about ordering a shawarma is watching the server remove the meat from the spit. Sometimes he will just use a knife, but these days the most common is to use a handheld electric saw of sorts that makes it look like he’s giving the cone of meat a shave! And where can you find some of the best shawarma in the country? Well, in truth, I’m a big believer in personal taste. 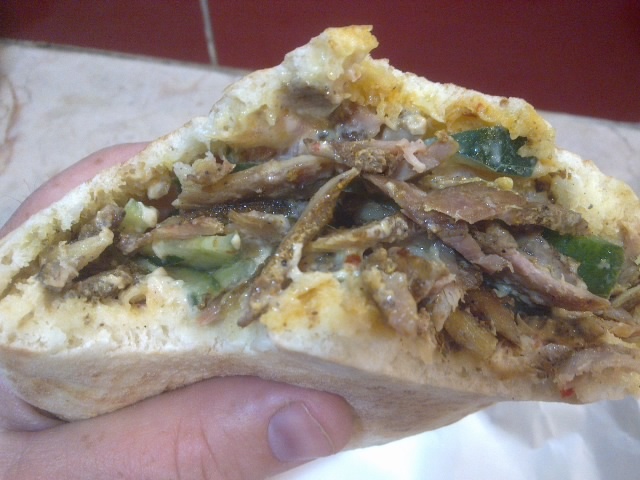 Ask five Israelis where the best shawarma (or falafel, or chummus, or…) is, you will get five (or more) opinions. And if you ask me, most people really have no idea what good food is. They choose their favorite because they have seen lots of other (perhaps similarly ignorant) people choose one place, or because they have heard one particularly vocal friend declare that he knows which is the best (as if this were something factual and empirical). Well, I am opinionated about food, and think I know good food. But I would never tell you that my opinion is automatically right on this. Rather, I’ll tell you that I feel strongly about this, but I’d strongly encourage you to do your own taste test. And speaking of shawarma taste tests, that is exactly what I did recently! On behalf of Young Judea Year Course, I accompanied my friend, comedian Benji Lovitt, along with a number of other friends in trying (and rating) some of Jerusalem’s best shawarma joints. You can see me and my friends in the final 5 videos in that post, and I am primarily featured in the videos for Falafel Doron, HaShamen and Arkadash. By the way, I wouldn’t put a lot of weight in the “ratings” chart at the end of that post, since the votes were made by different groups of people at each place, and thus had no standard. Me and my friends were a bit more tight on our ratings than the Year Course kids were, and in particular I would not recommend Moshiko. I think it is completely overrated and just is popular because it has the best location. Enjoy your Israeli shawarma. And as we say here in Israel, b’teavon (sort of like Bon Appetite)! Great article, Joel! Where is the best schwarma in Tel Aviv? But the best I can give you right now is where to find the best kosher burger in Tel Aviv (and the country) — Magic Burger on Ibn Gvirol, at the SE corner of Rabin Square. On your recommendation, I ate at Magic Burger. The burger/ meat was very good, but the home cut fries were absolutely out-of-this-world. Possibly the best fries I have ever had. Thanks. And thanks for the opportunity to participate in the taste test! Next time you decide to taste test…count me in! This is a GREAT article and I learned a lot I didn’t know!!!! Love your blogs! Fantastic post Joel. I for one add the schoog and the amba. No fair doing a shawarma tour without me though ;-). Not fair? Are you kidding me?! Would be an honor!